You’re going to be sopping up the french onion sauce with each bite of pork chop! 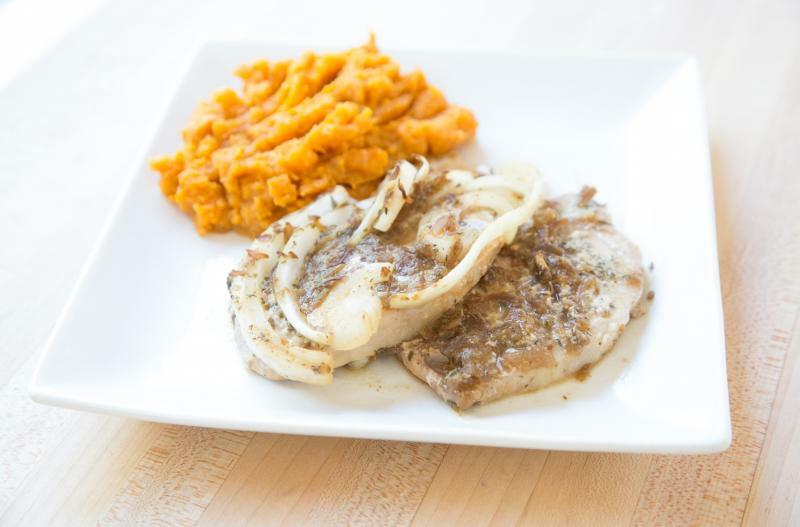 These French Onion Pork Chops are amazing! Enjoy! Preheat the oven to 375 F. Lightly spray a 9x13-inch baking dish with non-stick cooking spray. Place the pork chops into the electric pressure cooker insert with the hot water and sprinkle the onion slices over the top. Once cooked, add a Tbsp grated Parmesan cheese to each pork chop, then top with slice of Provolone cheese. Let melt, while the pork chops rest for 5 minutes before serving or slicing. Cooking time may vary depending on thickness of the pork chops. Serve Instant Pot French Onion Pork Chops with rolls and veggies. Slice 2 yellow onions into half moon pieces. In a mixing bowl, whisk together 2 - 10 oz. cans french onion soup, 4 Tbsp spicy mustard and 2 tsp dried thyme. Pour over the top of the pork chops and onions. Put baggie in the freezer and freeze up to 6 months in fridge freezer or 12 months in a deep freezer. Thaw in the fridge overnight, or a warm bowl of water for about 20 minutes, before adding contents of bag plus water to electric pressure cooker insert. Pressure cook as directed. See myfreezeasy.com/EPC for more tips and tricks. Add 5-10 minutes of pressure cooking time, if cooking from completely frozen or mostly frozen. Note that preheat time and release time may vary by appliance. Thaw, add hot water to Instant Pot and then add contents of baggie. Cook on high pressure for 15 minutes with sealed valve; then natural release. Once cooked, add grated Parmesan cheese and sliced Provolone cheese to each pork chop and let melt. Serve with dinner rolls and veggies.